This is a very hard question to answer, but repeatedly we've been answering yes. While the season was later getting going, it has been going steady for a week now. We've boiled four times on our new evaporator and made 220 gallons of syrup. In the picture below, each bottle represents a barrel of syrup. Slight variations in color are noticeable, but for the most part, the syrup has all been Amber Rich. We aren't sure why we think the syrup tastes better this year, but we think it does. But this is just our opinion--we will have to wait until the annual Minnesota Maple Syrup meeting in May to find out if other producers agree and wait to hear back from our customers to see if they notice any changes in the flavor this year. Perhaps our opinion is just skewed by the many new changes that we can now thankfully call improvements. It makes a maple syrup maker feel better about major improvements if they result in tastier syrup! After all, excellent syrup is the goal we strive for! Our new evaporator is heated with propane. Since we aren't opening and closing the doors of the evaporator every 10-15 minutes the heat source is continual. This keeps the boil consistent and minimizes mixing of the syrup in the pan. 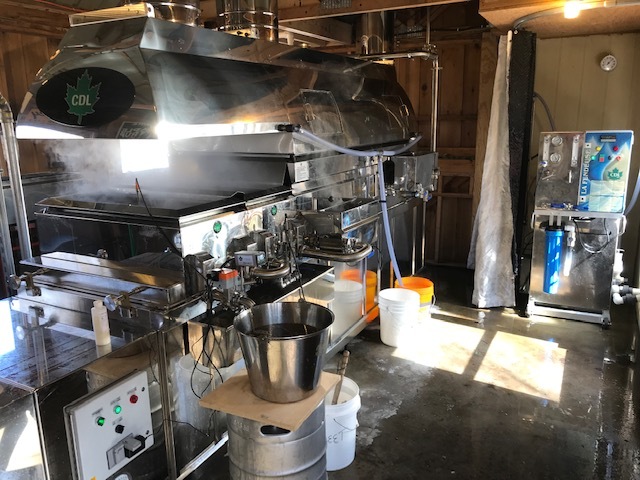 Since the sap enters in one location and travels a maze that is about 26 feet long, the steady boil keeps sap entering through the float box and reduces the amount of mixing of concentrated "near syrup" with "slightly concentrated sap". Essentially this prevents some syrup from remaining in the pan for an extended period of time and could result in better flavor. Related to the new evaporator, we purchased the optional automatic draw off feature. In the picture below, you can see the electronic read out of the valve controlling automatic draw off. The green numbers represent the set point that we enter. This is the temperature that represents when the syrup is done, or cooked to the correct density of 67% sugar. This number changes daily depending on the weather and has to be tested with a hydrometer or refractometer. Just like how there are instructions on pasta for how to cook at higher elevation (because they are always at lower atmospheric pressure), the boiling point of water (and therefore syrup) changes on a daily basis if a low or high pressure weather system moves in. If it is low pressure, the boiling temperature goes down and we can make syrup at about 217 degrees. If it is a high pressure weather system, we might have to boil the syrup until it is 219 degrees. Yesterday when we were boiling we were drawing off at 218.3 degrees. The white numbers on the screen represent the temperature of the syrup currently in the pan. When the white number is higher than the green number, the valve opens like in the picture below. When the white number is equal to or lower than the green number, the valve closes. So how does this change the flavor of the syrup? Just like the description about how the continual propane heat source minimizes mixing in the pan, the automatic draw off does the same thing. We are now taking off syrup in a near continual stream that is about the diameter of a pencil. 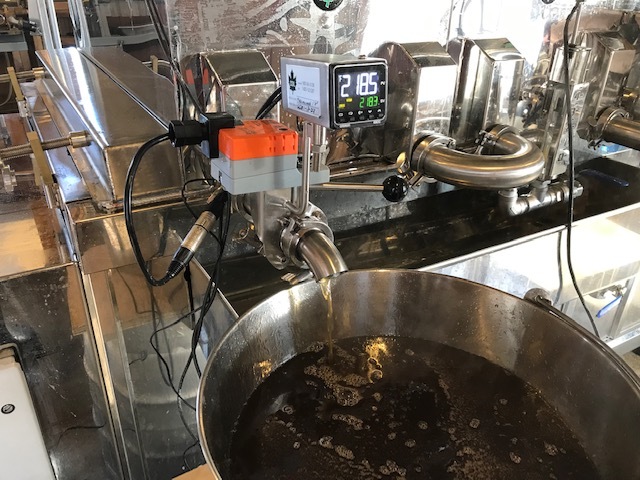 Previously we would draw off about 4-6 gallons of syrup at a time in small batches, then wait 30-45 minutes for the next "batch" to be done. So it is possible that the automatic draw off improves our syrup. Another change to the evaporator is how it is easily disassembled for cleaning. This evaporator is basically three pans. In the picture below, the larger back pan (where the stainless steel hood comes all the way down) is 3' x 7'. Then the sap exits the rear pan through the "U" shaped linkage into the first of the front two pans. This pan is 18" x 3'. It then exits that pan through another "U" linkage to an identical front pan. It then exits this pan through the automatic draw off valve. All of these linkages are easily disassembled, which allows us to remove the pans and clean them on a daily basis. With our past evaporator this was impossible. Previously, we took several other steps to clean the pans as best we could on a daily basis, but draining the pans and cleaning them was not an option. That required a Herculean effort; now it is quite simple. So it is possible that cleaner pans turn into tastier syrup. All of the reasons listed above might be explanations for why we think the syrup tastes better. We might also just be biased because of the significant investment! In addition to the changes to the evaporator, about half of the plastic tubing lines were removed and replaced this last summer. We have plans to finish the replacement of older lines this coming summer. There are obviously too many variables to know exactly why the syrup tastes great. Maybe it can be traced to the changes we made. Maybe it has to do with last summer's growing conditions. Maybe it could be related to our cold winter. Or maybe the syrup tastes the same! Regardless, the season is off to a strong start! We hope to have at least another week of cooperating weather. After that it looks like the overnight lows will remain above freezing.